I am using the gorgeous new Lovely Blooms stamp set today, along with the new Birthday Greetings set. I started off by stamping the floral image from the Lovely Blooms set on to TH watercolour paper. I stamped it with Versamark Ink and then applied detail white embossing powder. This was then heat set. The image was coloured using Zig Clean Color Real Brush Pens (the colours I used are listed below the supplies section). The panel was then die cut using the largest frame from the Dotted Patterns Scallop Frame Die collection. This was added to a white A2 card base with foam sheet and DST. I took one of the sentiments from the Birthday Greeting stamp set and stamped this on to black cardstock with Versamark Ink. I applied the same detail white embossing powder and heat set. This was then cut in to a strip using a craft knife and metal ruler. It was added to the card with clear foam tape. To finish off, I added a sprinkling of clear gems from the new Spring Gems collection, which is a free gift with purchase this month. ZIG CLEAN COLOR REAL BRUSH PENS: Large purple flowers - Light Violet 081, Violet 080. Pink flowers - Pink 025, Carmine Red 022, Geranium Red 029. Small purple flower heads - Lilac 083. Small coral flowers - Pale Pink 028, Pink 025, Yellow 050. Light green leaves - Light Green 041. Darker green leaves - Green 040, Yellow 050. Teal leaf branches - Turquoise Green 042. Outside shadow/colour - Light Blue 036. For the hop, you should have arrived here from the amazingly talented Rubeena. Next in the hop is the super talented Kaja. For more information on the hop and to start from the beginning, please head over to the Studio Katia Blog. Remember that there will be another hop tomorrow with lots more inspiration too. Studio Katia are giving away two $100 (CAD) gift certificates to the Studio Katia store on each day of the hop. That is four chances to win! The winners will be chosen from the comments left across all the stops in the hops, so the more you comment, the more chances you have to win. Comments close on Saturday 2nd June 2018 at 11.59pm EST. 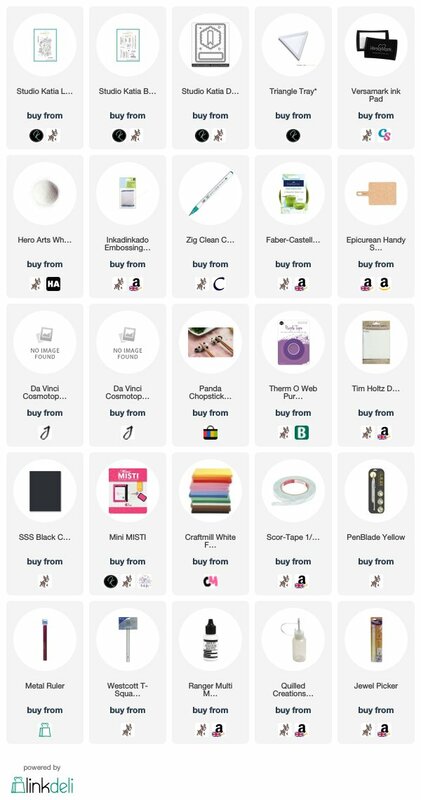 The winners will be announced on the Studio Katia blog on the 3rd June. Good Luck! Thank you so much for visiting me today. I hope you have a wonderful time on the rest of the hop! Goodness gracious... that is a beautiful card. I might be in the mood to watercolor now... :). Stunning. Such stunning work - I think your work is amazing! Gorgrous card... Awesome coloring..love it. Gorgeous card, thanks for sharing! Your colouring is divine! Beautiful card! Your card is absolutely stunning, Ilike how you water color with markers. It's a fantastic release, a super hop, and wow your card is amazing, too! Very well done, and thank you for your gorgeous inspiration! Thanks for showing your process for water coloring with the Zig markers. Your end product is beautiful! Gorgeous work! I love the colors you chose and the stunning way you color! A beautiful card! Love the coloring and the scalloped die that you used to cut the image out. Your card is gorgeous. That stamp set and this release are amazing. Thank you for the video with all the coloring. I struggle with the blending and your video has given me some inspiration to try. 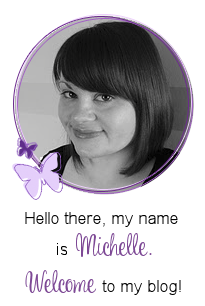 This is simply a stunner Michelle. BTW, I have better luck on wc paper than with Bristol and prefer that as well. I will definitely be practicing more with it now. Would love to get that stamp some time, its awesome. Thank you for letting us watch you color this beautiful image. Great results. Oh my !! What an amazingly beautiful card !! What a beautiful card. Your coloring is gorgeous. Great coloring with Zig markers. A lovely card. I like the scallop die you used. I like the colors of green you used in the leaves! 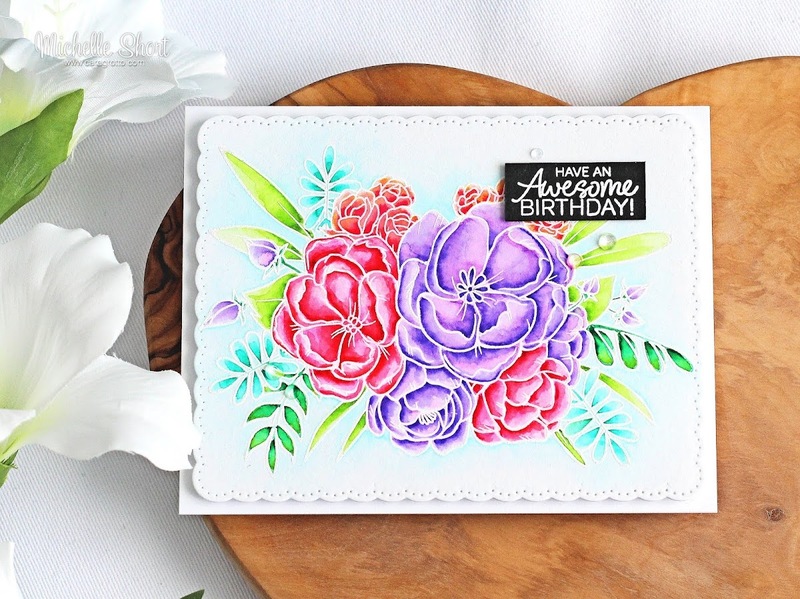 Stunning card - this floral bouquet is so lovely and you did a wonderful job coloring it! Lovely card with vibrant colors. What a stunning card! Love those bright, bold colors! Wow!! Stunning card!! Love your coloring!! With slightly different colouring, this would make a sensational wedding card too!! Beautiful coloring. Love my Zig's. The scallop frame die is very nice. The colors of the flowers are gorgeous! such a pretty card! Love this new floral set and your bright but soft colors! I love your cards. Very pretty. You make it look easy! So beautiful. Thank you for sharing your cards. Love your card, it's stunning - love watching you colour - my techniques aren't the best. Tfs. HAPPY 2nd BIRTHDAY, STUDIO KATIA. Beautiful layering and coloring! Love this gorgeous floral card! Love the colouring on your card and I love the die you have used for it. 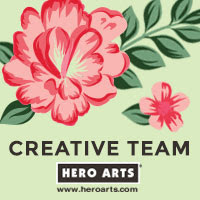 The coloring on the beautiful,floral image is gorgeous and I appreciate you leaving it all in the tutorial. I feel like I learn a lot just watching. Nice coloring, thank you for the video! Happy 2nd anniversary Studio Katia! Beautiful card and thanks for the video too! Wonderful coloring ! Thanks for sharing . Cheering and applauding in seeing your creativity recognized for this new release! Your painting of the Lovely Blooms elevates them to stunning, striking, gorgeous! As always, your video is engaging...such fun to watch the magic unfold! Absolutely stunning and very beautiful card!! such beautiful colors and coloring! Your card is beautiful, the stamp is gorgeous and your colouring is fantastic. Thank you so much for the video, it helps a lot ! Love how you colored the great Lovely Blooms stamp! The colors are SO lovely! Thank you for the inspiration. how beautiful. i may need those markers. . . Your card is beautiful ! Your coloring technique is fantastic. Thank you for the video! Your coloring is fantastic!!! Very beautiful card Michelle! Thank you for sharing. Your card is stunning. Love it! I love the beautiful bright colors! Stunning card! So beautifully colored, fantastic color combo. Love how the zig markers look on your project. I might have to give them a try (I dont own them). Love the coloring! Congrats SK on 2 years! Beautiful, beautiful card!! Love the colours on it. SQUEAL!! LOVE LOVE LOVE your BEAUTIFUL Card!! SUCH AWESOME Design!! THANKS SO MUCH for sharing the Video too and hope you have a FABULOUS Memorial Day WEEKEND!! Beautiful card. You are very talented, thank you for sharing with us. Gorgeous! Thank you so much for the video highlighting coloring with Zigs - I just got some and am working on how to use them. Pretty colors and I like the scalloped panel. Look how bright and vibrant the flowers are! I never could get the hang of the zig clean color real brush pens and ended up getting rid of them- but you're making me wish I hadn't lol! Your card with the "Lovely Blooms" is so very beautiful, Your attention to detail is just marvelous. The pretty scallop stitched die sets it off perfectly. Thank you for sharing your talent with all of us. Wow! What a gorgeous card!!! Beautiful card as ever Michelle! Your card is beautiful. I just love the colours that you chose. Thank you for showing all the colouring in your video. Wow, wow, wow!!! This is absolutely GORGEOUS, Michelle!!!! This bouquet is so pretty! Gorgeous card. This is such a pretty card. I love the colouring and the die cut background choices. Wow, beautiful watercoloring! Love the scalloped edge on your card and the pretty Spring colors of the flowers! Such a pretty card Michelle! Love this floral stamp! Stunning card! Your watercoloring is just amazing! I really like this new floral stamp set. Beautiful card!! Love the coloring! What a beautiful card, thank you! Such beautiful colours. Love it! Love your beautifully water colored flowers on the white, scalloped background. Clean and fresh! Absolutely gorgeous coloring on this fabulous card! Lovely Blooms is a must have stamp! This card is stunning! I love that you used a white background with the lacy border for the card front. It makes your colored floral image really pop! Lovely card. I really enjoyed watching your video as I am obsessed with learning how to get better at this craft! Such a soft and romantic floral you have achieved here in this Zig coloring. I don't know how you do it; mine always either seem so washed out or way too bright. I will watch your video and see how it is done properly! Thank you for sharing this. Cheers! Beautiful card and I love your video! Thanks for sharing your technique for these gorgeous flowers! Michelle - Your cards are always so lovely. This stamp set is my favorite! 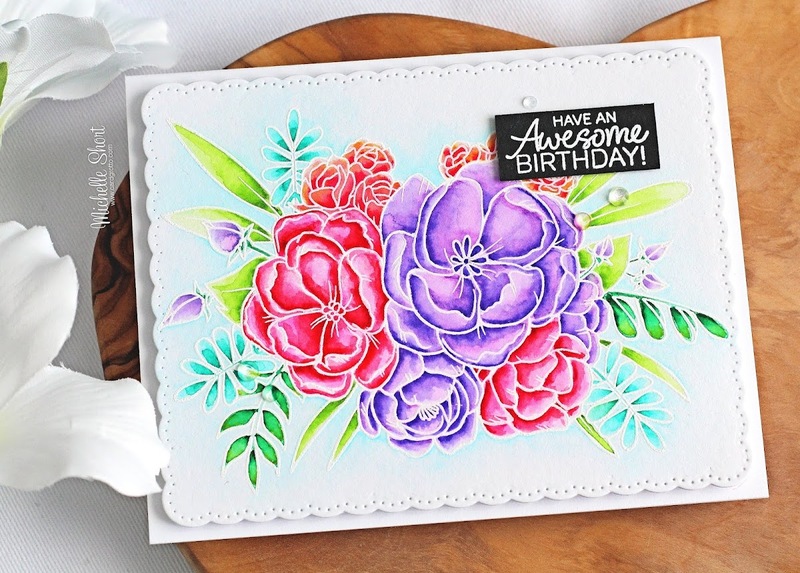 The lovely blooms stamp seems to be a favorite in this release; your version is marvelous! I like how you cut it out after you colored it in with the die that is scalloped or rounded. It reminds me of old fashioned lace. Enjoying the red, teal, and purple colors. Thank you! Lovely card and an awesome video!! Beautiful! Your color choices are amazing! TFS! This is such a fabulous colour palette on this card. Thanks for sharing the technique video.